This year’s Lawrence Academy of Music Girl Choir’s annual December concert will have a personalized meaning for the more than 300 young voices in the program. Two performances of “I Believe” will be staged Saturday, Dec. 8 at 2 p.m. and 7 p.m. in the Lawrence Memorial Chapel. Tickets, at $12 for adults and $8 for students/seniors, are available through the Academy, 100 W. Water St., Appleton or 920-832-6632. Using choral music as the lens through which to explore individual and community values, beliefs or customs, five choirs will sing a variety of sacred and secular repertoire. Program notes will explain how each selection was used within the rehearsal process to explore the concert’s “I Believe” theme. “As we move into the darker months of the year, people tend to be more reflective and introspective,” said Karen Bruno, director of the Academy of Music and conductor of the Bel Canto choir. “Preparing for this concert gave the girls an opportunity to explore what they stand for, what they hold dear and how the compositions they sing connect to those ideas. “We look forward to sharing the emotions, ideas, and values expressed within the repertoire and within our community of singers with our audience,” Bruno added. 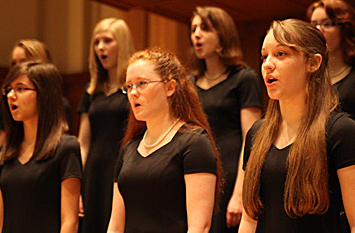 The concert features girls in grades 3-12 in five different choirs, including the high school component Bel Canto Girl Choir (grades 9-12), which earned second-place honors in the 2012 national American Prize in Choral Performance competition and the Cantabile Choir (grades 7-9) which performed at New York City’s Carnegie Hall in 2011 as part of the National Youth Choir.